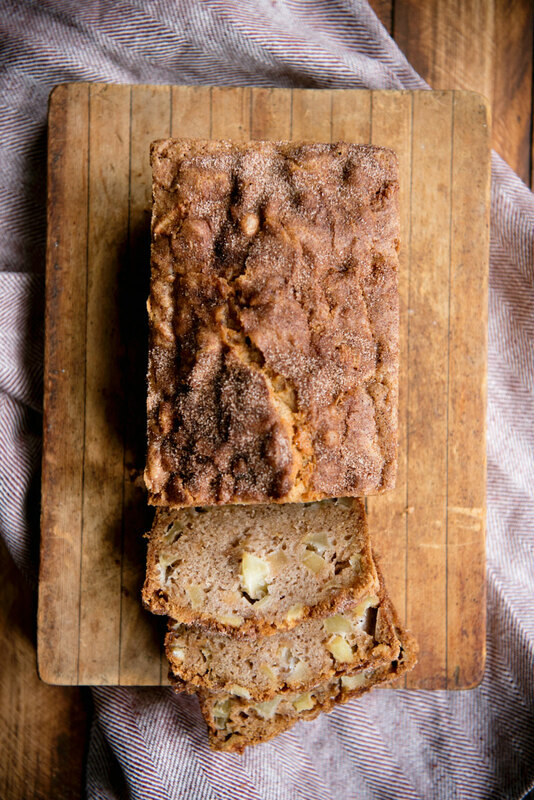 An amazing Quick Apple Bread Recipe topped with cinnamon sugar. 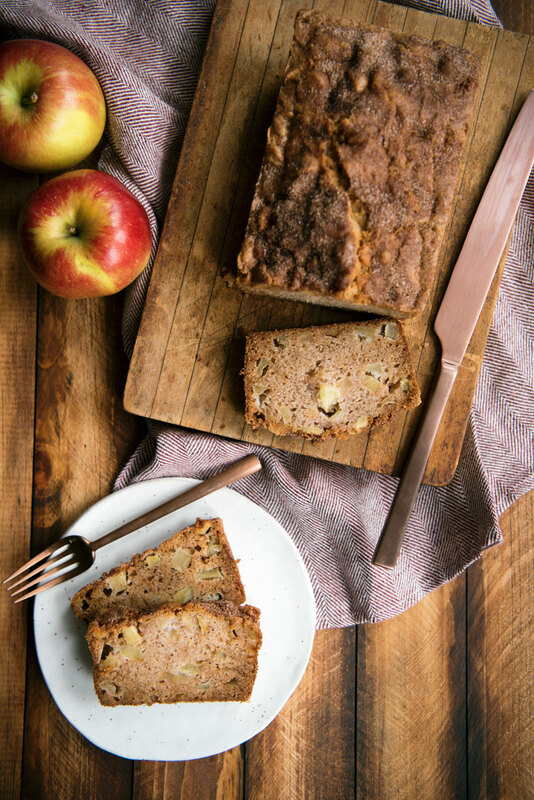 Easy to make, sweet and so delicious and packed with real apple chunks. There is something so comforting about homemade bread, be it savory or sweet. 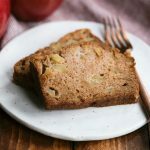 I made this quick apple bread recipe for a friend who was going through a hard time. It was shared between girlfriends while we talked about the past and made plans for the future. We also tackled a big wedding project – for some reason I decided homemade napkins would be the perfect touch for our dinner table. I even bought an overlock (serger) sewing machine so they would be extra pretty. Making 50 napkins by hand definitely takes a village. The fabric has to be measured and cut, the edges serged, the edges folded and then straight stitched. Oh, and every one has to be ironed at least three times! However, the most complicated part by far was threading the overlock machine – so many spools, so many instructions!! I need to take pictures so I can share our labor of love! 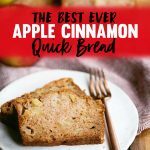 This bread is so easy to make and the combination of the soft, chewy apples with a bit of crunch from the cinnamon sugar is absolutely heavenly. 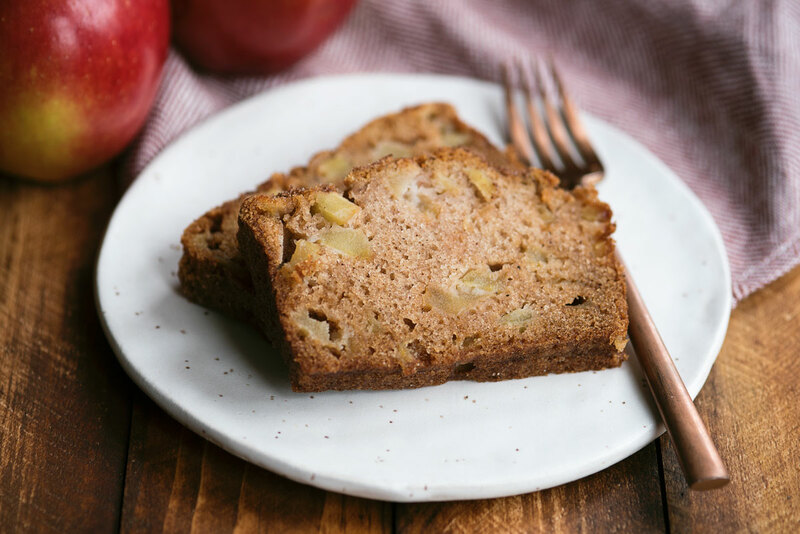 You’ll want to make this recipe over and over for as long as apples are in season! 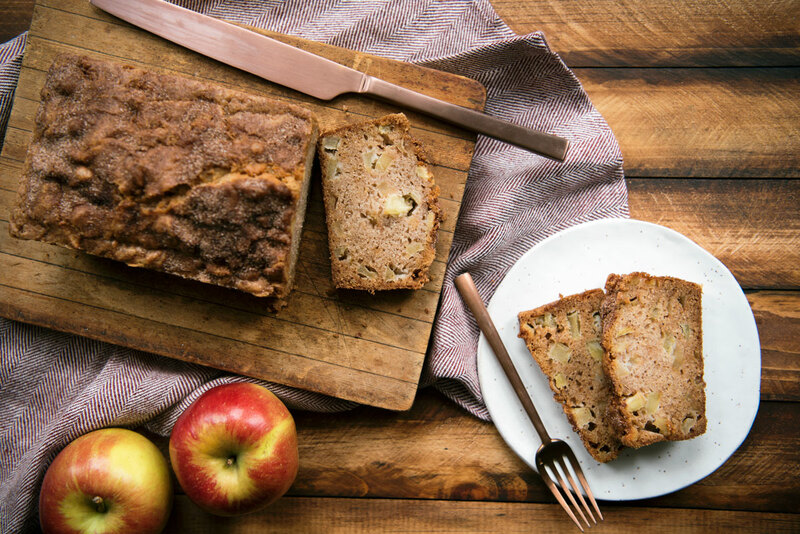 If you’re wondering what type of apple to use for this bread – pretty much any type will work! It’s good to pick one that won’t get mushy when cooked (macintosh are notoriously mushy). You could try Granny Smith, Honeycrisp, Fuji or Gala. Add the oil, eggs and vanilla and stir until just combined. Mix together sugar and cinnamon and sprinkle over bread. Bake until a toothpick inserted into the middle of the loaf comes out clean, about 60 minutes. Cool for ten minutes then remove from pan to wire rack. Let cool until just warm and then slice. P.S. 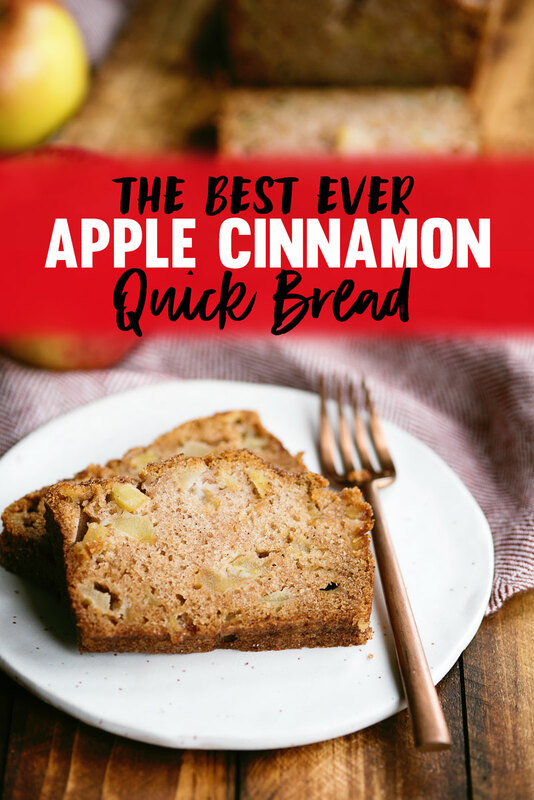 – Craving this apple cinnamon quick bread? Pin this recipe for later! 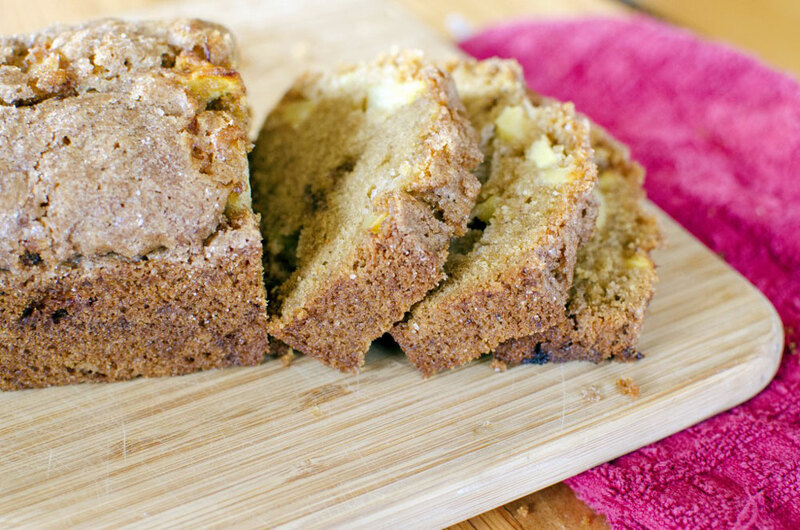 Look for more quick bread inspiration? 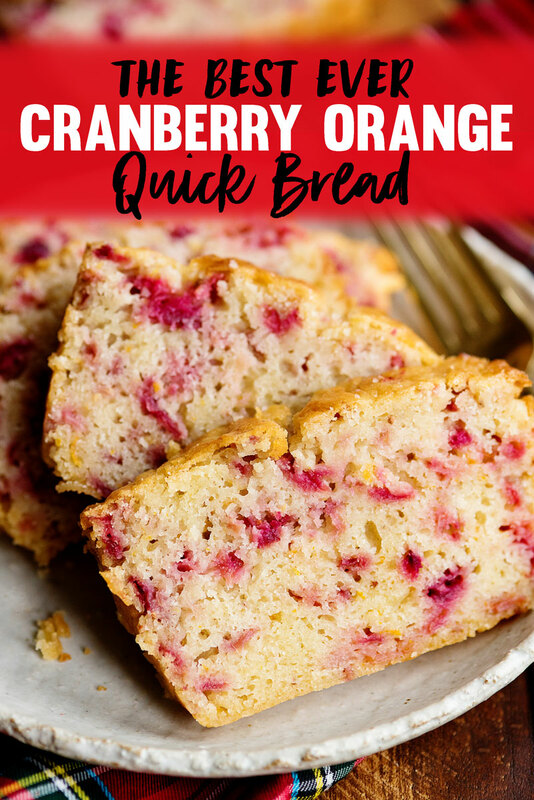 Try this Cranberry Orange Quick Bread! Thanks for sharing this great recipe! I’ve gotten so many compliments.Like other commentators here, I get better results when I run the apples through a blender – consistency and texture is better overall. I also put a little less sugar and a little more vanilla, but that’s just my preference. Has anyone thought about processing the apple in a VitaMix, complete with skin and core? I may try it tomorrow. Interesting idea! Let me know if you try it! Love this recipe! Can this bread be frozen after being baked? I haven’t tried! Let me know how it turns out if you do. That’s amazing! So glad to hear it! Such a great recipe. My kids made this for their teachers, I made it for coworkers and we even brought it to Thanksgiving. We have made the regular loaf and 8 small loafs. This is now a family favorite. So much flavor and so moist. 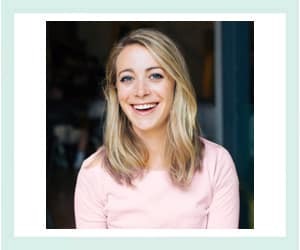 Hi Danielle – Thank you so much for this amazing review! I’m glad it was a part of your holiday celebration. Awesome! I know everyone will love it! I’m so glad readers have left these suggestions (like applesauce) for other people to try. Happy holidays! Perfection! Better than I imagined it could be. I have to eat an anti-inflammatory diet, thus all the substitutions. WHAT A PERFECT ADDITION TO MY HOLIDAY TABLE! Amazing! Thank you so much for sharing I am so happy to be a small part of your holidays!!! I’m making it again today! Do you keep it on the counter or in the fridge when storing? I wasn’t sure with such a moist bread if it would mold quickly. Room temp is fine for a few days!!! Just baked that wonderful bread. Did do some adjustments. Used the applesauce oil for a bit more flavor. Also used half white sugar and half brown, also added walnuts and since the batter was a touch stiff added 1/4 cup buttermilk. The topping I used brown sugar in lieu of white. Thanks for the recipe. Am taking it for our sweet tray Christmas Day. The apple bread was the sweet tray hit of the family Christmas party.Thank you for putting such a good thing online. I’m 79 and feel your never to old to ddtop learning and young people have a great deal to contrihute. Sooo, Happy New Year everyone!!! Hi Jackie – Your comment made me SO happy! I’m so glad you enjoyed it and your guests did too! I just made 6 small loaves … I added another apple ( like a lot of fruits in my bread ) so it was about 3-1/2 cups. I got 3 small loaves per recipe above with added apples. This is a really easy recipe and VERY tasty. The first 3 loaves, I did not add the sugar/cinnamon topping and it was PERFECT & crispy. I did find, however, that it tasted a little oily. Have you adjusted the oil – maybe by a couple tbsp? Thanks for sharing … I’m going to check out some of your other recipes. Hi Colleen – Thanks for the feedback. I think I will try to remake it using your suggestion of less oil and see if this would make the recipe even better! I was wondering if you could use a can of apple pie filling with this? I don’t get to the store often, so fresh apples are not always available.